In response to the Holy Father’s wishes for this Year of Faith, plans are being made in parishes and dioceses all over the world to “celebrate” Vatican II in light of the 50th anniversary of the Council’s opening. But how many Catholics have an appropriate understanding of what it means in this case to celebrate? Imagine your favorite team blazing a trail through the regular season and then the playoffs, going all the way to Super Bowl. That would be a cause for celebration, right? Now, imagine also the team’s head coach drawing up a robust game plan for the big contest, but for whatever reason, a good number of the players never actually got around to opening the playbook. Whats more, some players even decide to riff on the coach’s playbook, improvising a little bit here and tweaking little bit there. Even some of the position coaches get into the act, and before very long, the team breaks down into factions, with each group favoring its own particular view, while a whole bunch of players in the middle are left not knowing what to do or believe. Well, needless to say, two quarters into the big game, the players find themselves locked in a terrible struggle — not just against their opponent, but against one another as well. As halftime arrives, they make their way to the locker room, tired, bruised and confused. What do you think they should do once inside? Uncork bottles of champagne? Jump up and down and congratulate one another for having an association with the big event? No, of course not! What they really need to do is set aside all of their preconceived notions and opinions and get into that playbook: to become unified as a team once again so that together they can confront their true opponent and go about doing the things that are necessary in order to secure a victory! What on earth does this have to do with Vatican II? Well, it seems to me that most of us very naturally tend to think of celebrating in terms of festivity; reveling in the joy of a major accomplishment, like graduating from college, or perhaps a significant life event, like getting married. When it comes to Vatican II, however, that kind of celebrating is no more appropriate than it would be for that football team I just described. Even as we joyfully embrace this opportunity to reflect upon the Council, with renewed determination in this Year of Faith, this is not the time for festivity or revelry, because let’s be honest: There is far too much confusion and disagreement and division in our ranks as it relates to the Council. It’s time for us to set aside our own preconceived notions and opinions and to get into the playbook, so to speak. It’s time to delve into the Council documents and get on the same page with one another, achieving unity under the banner of Christ the King once more, so that together we may engage our true opponent, who desires nothing less than our eternal damnation. To hold this Council up to the purifying light of sacred Tradition; to make well-known its teachings and its place in the life of the Church – and just as importantly – its place in our lives as believers and followers of Christ. This is precisely what Pope Benedict XVI had in mind when he issued his Apostolic Letter, Porta Fidei, in which he said that he deliberately decided to launch the Year of Faith to coincide with the fiftieth anniversary of the Council’s opening in the hope that doing so would serve as an invitation for the faithful to enter the fields of the Council and, at long last, to undertake the critically important work of harvesting the fruit of Vatican II. Harvesting is a work not best carried out in the dark of night for obvious reasons. In the darkness, it’s difficult to distinguish between that which is ripe and sweet and nourishing from that which is hard and bitter or may not even be fruit at all. As we explore the Second Vatican Council in response to the Holy Father’s encouragement, ours is a work that must be carried out in the light as well. Not just any light, but the light of sacred Tradition. In other words, in order to approach the Council correctly, we must understand and evaluate all that it proposes in the context of, and in continuity with, sacred Tradition. We must therefore have a clear understanding of what this Tradition. The word tradition itself comes from the Latin word tradere meaning to hand over or deliver. And so Tradition can be described as that which hands over the Faith that comes to us from the Apostles, in all of its fullness, to one another and to our children and grandchildren. It’s critically important for us to realize that the Faith that is being transmitted, this Tradition, is the same yesterday, today and always. It is immutable. That is, it is unchangeable, and this is why the Holy Father so often stresses the need to view the Council’s teachings in continuity with Tradition – the only light that can illuminate for us the sure path to truth. With The Holy See encouraging the faithful to explore the documents of the Council firsthand at long last, we have every reason to be hopeful in this Year of Faith. This is a great article. 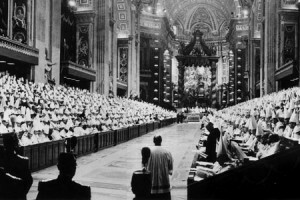 Was Vatican II about rupture or reform? Was it about continuity or discontinuity? It was about reform, the Church is always being reformed. Rejoice in the Lord always; again I will say, Rejoice (NRSV, Phil 4:4). This is the day that the LORD has made; let us rejoice and be glad in it (NRSV Ps 118:24).